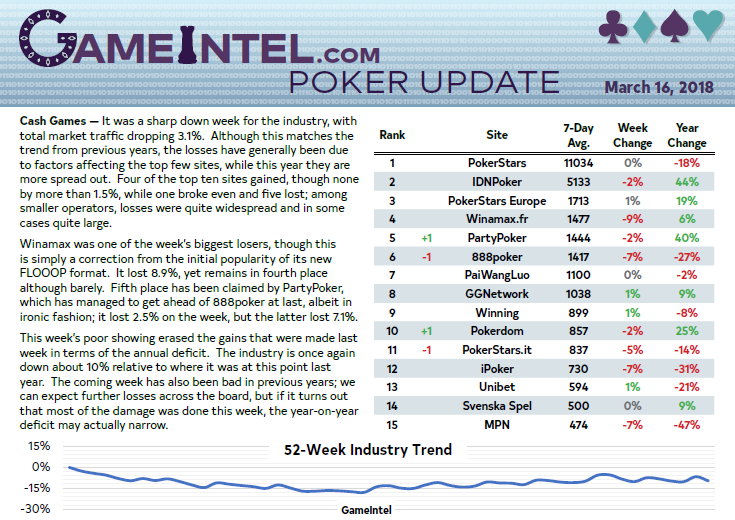 GameIntel is excited to bring you the new Poker Update newsletter. Delivered straight to your inbox twice a week, the Poker Update gives you all the news and analysis you need to stay on top of things. Market analysis and commentary based on our exclusive GameIntel data. Year-over-year traffic comparisons to give you a clear persepctive on the winners and losers in online poker. Summary and analysis of the week's major tournaments. Performance predictions for the weeks and months ahead. The Poker Update is only available to our subscribers. If you are a professional in the online poker industry or in a related field, please contact us for more information on our subscription rates.